More and more artists are finding that Instagram is THE place to be to cultivate a dedicated following and sell more art online. Whether you’ve been playing the Insta-game for a while and are a pro at running Instagram flash sales or you’re new to the platform, you’ll find inspiration in this list of 7 artists who are killing it on Instagram. 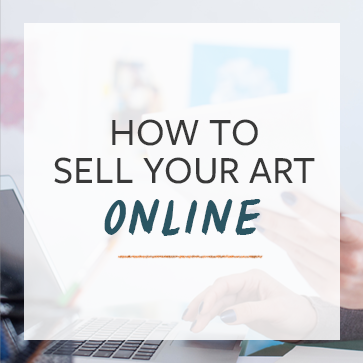 For more artists doing awesome things on Instagram, check out this post: How to Sell Art on Instagram. 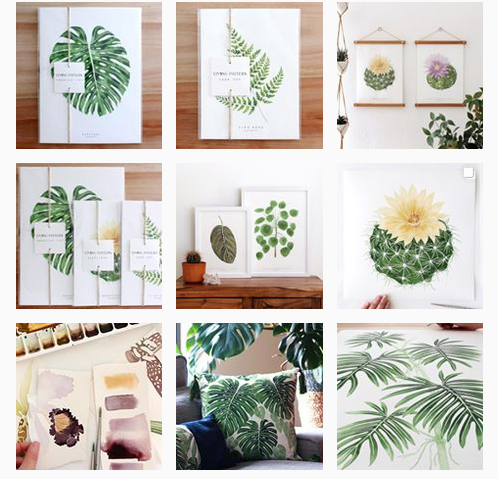 @livingpattern: One glance at Jenny’s feed and it’s easy to see why she has so many followers- it’s a very beautiful and cohesive feed with bright photos and lots of white and green. She includes exclusive discount codes in many of her captions, which adds a little extra value to being a follower. She posts photos of her finished art, her work space, and her works in progress. All are very well lit. Her posts receive a lot of comments, and she responds to all of them. 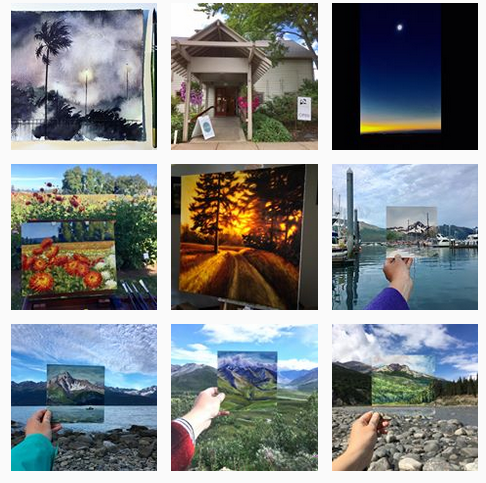 @amirarahimart: Amira Rahim’s feed is colorful, but consistently so. Amira posts many photos of works in progress, as well as charming pictures of her smiling face sprinkled in with inspirational quotes, shots of nature and things that inspire her, and photos of her work framed on people’s walls. @piperpottery: Cammie Meerdink creates stoneware pottery with a heavy focus on leaves. 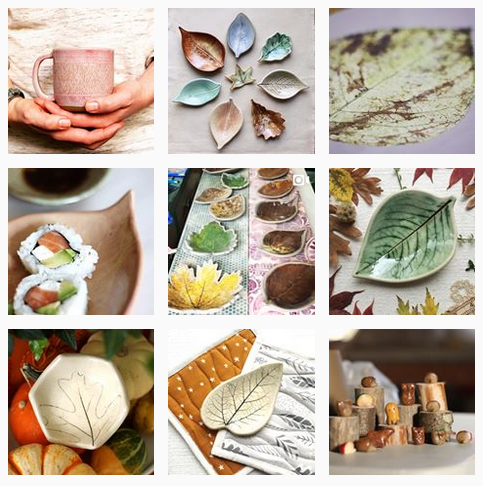 She posts mesmerizing videos in which she slowly peels a real leaf away from a new piece of pottery to reveal the intricate leaf pattern left behind in the clay. 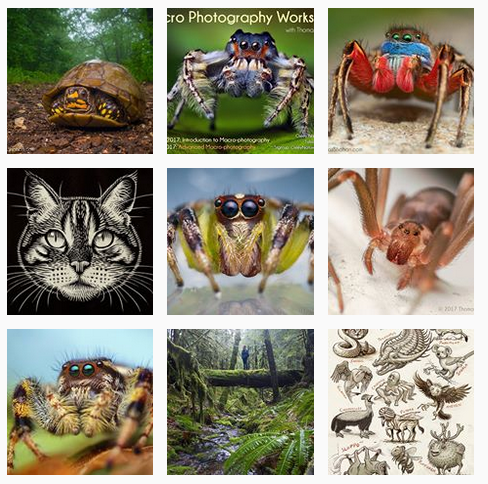 @thomas_shahan: Thomas Shahan is an illustrator and photographer specializing in macro shots… of spiders. Take a look even if you can’t stand spiders, because Shahan does the impossible and makes them look cute. 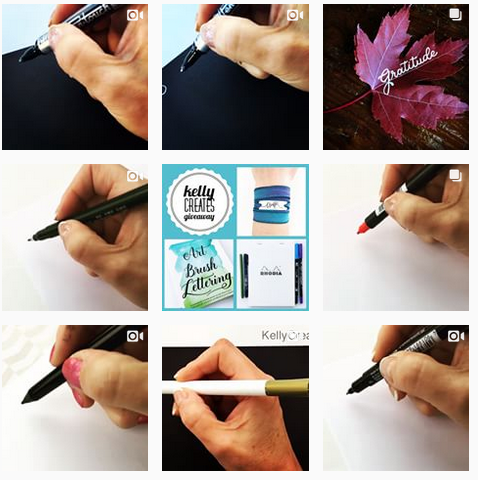 @kellycreates: Kelly Klapstein is a calligrapher who captivates her followers with her lettering videos. They’re simple, closeup, and hard to look away from, which earn each video over 100k views. She uses her videos to help sell her art and hand lettering courses and books. 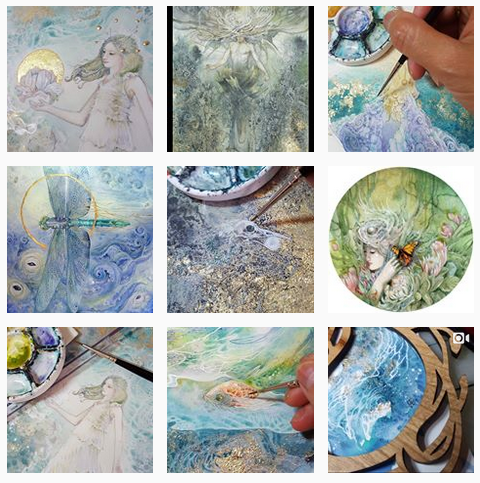 @spmlaw: Stephanie Law creates fantastical pieces with watercolor and gold leaf. Her feed is very consistent (not that occasional shots of your dog or selfies are wrong, but the cohesive look is professional and visually appealing.) She gives close-ups of her very complex pieces as well as timelapse videos of her works in progress. She uses her Instagram posts to share where and when the works in progress she’s sharing will be available for sale. Not sure if Instagram is the right choice for you? Check out this comprehensive piece on how to choose the right social media selling platform. Do you know an artist who’s doing great stuff on Instagram (or maybe it’s you)? Share in the comments and spread the love. And of course don’t forget to follow @theabundantartist on Instagram too. I’m not sure if you’ve ever covered a piece on Wendy McWilliams? She kills it! Thanks for sharing these artists with us! Some amazing art! Keep up the good work! I would really like to have your interview these people and ask how they got their following and what they do to get sales from this platform. I’ve found with Instagram it’s sort of luck if you take off on the platform. Videos and going viral is what propels many of these artists to large numbers . Amazing art and really interesting insight into different peoples approaches to their feeds. Some great finds here. 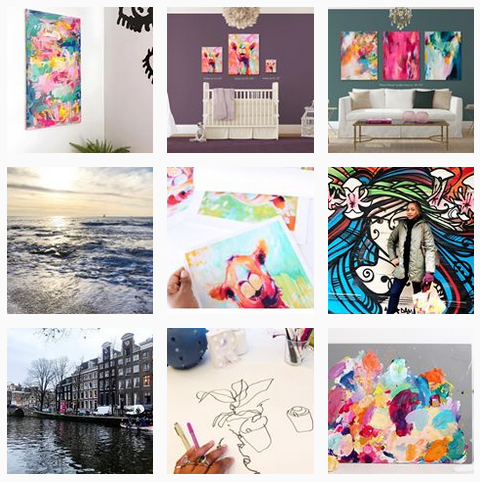 Instagram is without a doubt an essential tool for marketing and selling your art these days. But building a following can take time and patience, don’t expect to become huge overnight. You need a solid strategy and stick to it consistently. Amazing list, beautiful work, already started following one . Love this page! Thanks so much for the advice. Would love it if you showed a budding artist some support!